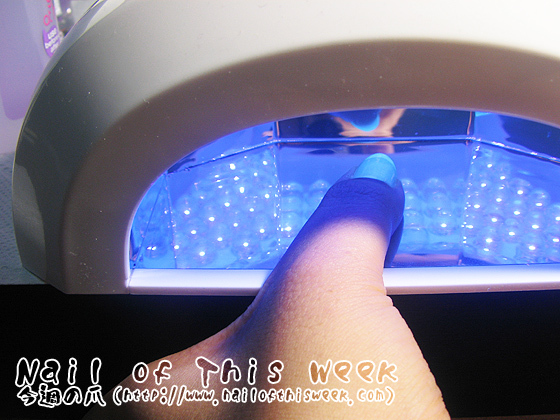 Essence Gel Nails at Home: Second attempt (on my nails) : Nail of This Week. After the practice, now the time for gel manicure! Above is the final look I’ve done for now. 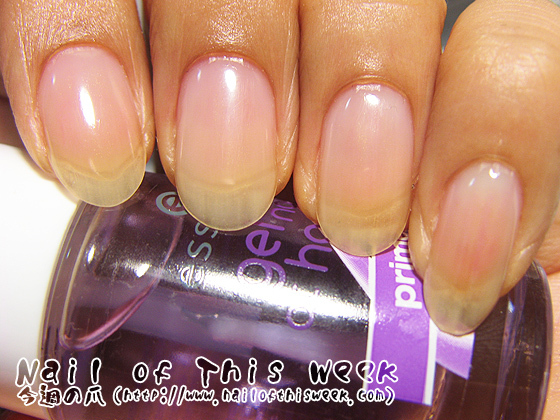 Pardon my crap yellow lines & cuticles…yep, they looks like bare nail BUT NOT. Because if I use polish in between the base and top gel I MUST wait til this polish will be completely dry and I couldn’t be patient for that (simply due to lack of the time), I’ve decided to use “French Gel Top Coat” cause it says I can finish the gel mani by 1 layer of base gel then 1 layer of French top gel. 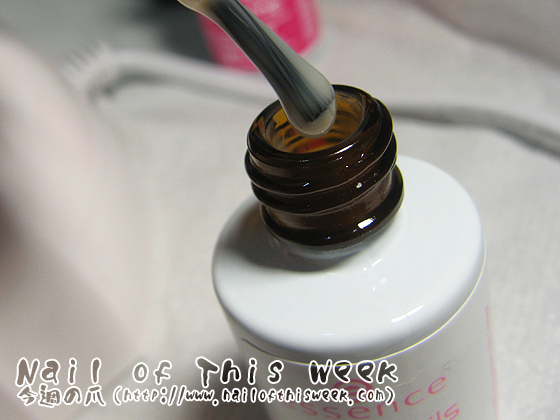 ...it was SUPER sheer milky-pink beige gel. But well, at least this pink-ish color did masked yellowing of my bare nails so I didn’t feel so bad in the end. ...remove your cuticles and push them up. Otherwise, gel will cover your cuticle and get lifted. Gel lift is something we REALLY must be careful, because of 1) frequent removal of gels (either soak-off by acetone or peeling off) can damage the nail plate and 2) it can cause “green nails” = fungus/mold infection on the nails. 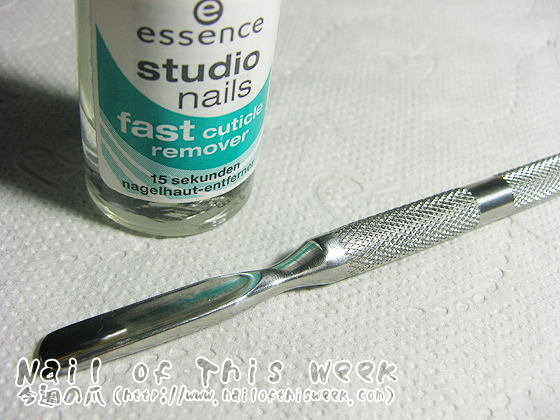 This time I used cuticle remover from essence, waited for while and gently pushed up with metal pusher then removed dead skin by scrubbing with the piece of tissue paper, but you can use any tools/cuticle removers to remove excess dead skins. ...THIS. The lamp is not big enough so I had to put my thumb individually like this, but it’s only 1 min that it wasn’t so stressful. 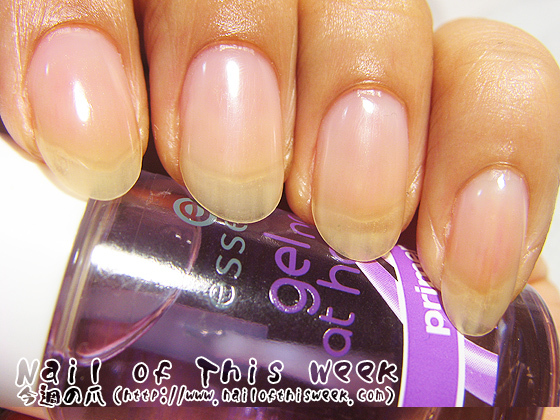 So…actually I’m pretty satisfied with the gel mani by essence! It’s fast and easy, nothing complicated and is protecting my nail very well even right now. I’m going to keep this mani for at least next one week that I can see how it’ll keep on my nail. Thank you for the brilliant detailed review! I find it hard sometimes to get good reviews of new Essence kits or ranges. I don't think I will be purchasing this at all - it seems like a lot of work for something that I'm not really interested in, to be honest. I think it's a great idea for people who like gel nails but I would never use them so I don't think it's for me.